(CBS News) PUEBLO, Colo. - Republican presidential nominee Mitt Romney on Monday attacked President Obama for referring to ongoing unrest in Middle East as "bumps in the road," and said that as president, he "will shape events" in the region. 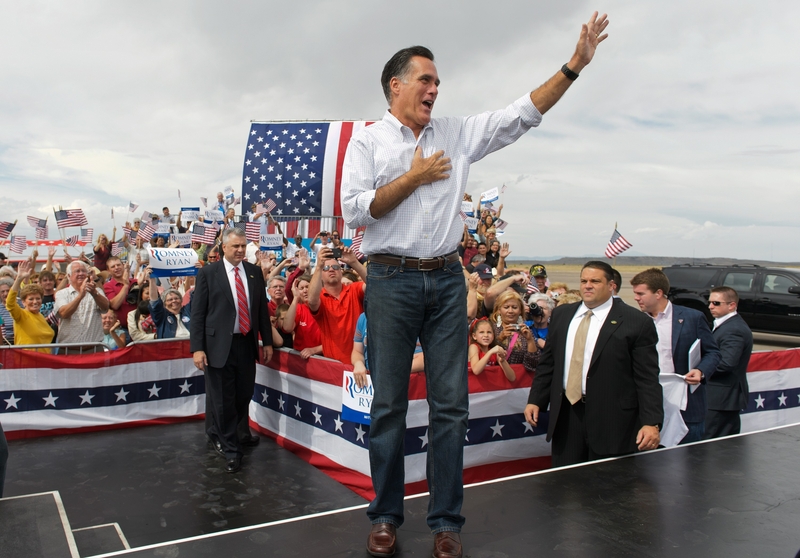 Speaking to a crowd of more than 1,500 people in this town in southern Colorado, Romney said, "This is a time for a president who will shape events in the Middle East, not just be merciful or be at the mercy of the events of the Middle East. I will get America on track to have the kind of leadership we need so we can shape the future of this part of the world and keep America strong." Romney offered no specifics about how he would shape events in the historically volatile and war-prone region. While he has largely tried to keep his focus on the economy and high unemployment numbers, Romney took the opportunity to go on the offensive on foreign policy after Mr. Obama was asked in a "60 Minutes" interview on Sunday about the pro-democracy uprisings in the Arab world that have led to creation of governments with ties to extremist Islamic groups. Obama said on the CBS News program, "I think it was absolutely the right thing for us to do to align ourselves with democracy, universal rights, a notion that people have to be able to participate in their own governance. But I was pretty certain, and continue to be pretty certain, that there are going to be bumps in the road because in a lot of these places, the one organizing principle has been Islam." Romney pounced on the president's use of the phrase "bumps in the road," suggesting that Mr. Obama was in effect minimizing the recent killing of the U.S. ambassador to Libya, the popular uprisings in Syria that have killed over 20,000 and the election of a member of the Muslim Brotherhood in Egypt. "The world looks at the event going on, they don't see these events as bumps in the road," he told the crowd at an aircraft museum. "These are lives. This is humanity. This is freedom. Freedom must be on the march. We must stand for freedom." Romney had a similar response in an interview with CBS News' chief political correspondent Jan Crawford on Monday. The Obama campaign was quick to strike back, with one campaign official pointing out that the president made no mention of Libya or the American ambassador's death in his comments. Obama campaign spokeswoman Lis Smith said in a statement, "He's purposely misinterpreting the president's words and making reckless statements about the death of four Americans in Libya, apparently for the sole purpose of his own political gain. Using this incident to launch political attacks should be beneath someone seeking to be our nation's commander-in-chief."